Wine in luxurious tubuses – this may become a hit! Wine in cardboard boxes is not highly regarded by the more pretentious wine lovers. Fortunately, three men devoted to exquisite cuisine and high quality wine have decided to change this point of view. Daniel Johnnes – a Renaissance sommelier, Daniel Boulud – a world renowned chef and Dominique Lafon – one of the most respected wine producers worldwide. 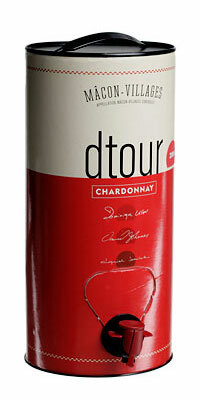 These are the brains behind DTOUR, the world’s first high-class wine in a luxurious tubus. According to Daniel Johnnes the shrinkable bag inside the tubus holds the wine out of reach of oxygen and keeps it fresh for a long time. They claim that it will retain its taste for six weeks at least. With the wine tubuses we would like to say “Cheers!” and goodbye to bottles of flat wine!